Believe it or not, it seems like artificial intelligence might just take over the trading scene as well. Trade Ideas Pro is one of the best AI market scanners out there. What is Trade Ideas Pro? It is a software that will allow you to scan all the data you might need in under a second. Hundreds upon hundreds of professional strategies alerts, filters and scanners are all packed in this piece of software. It first came to be back in the early 2000s however, this masterpiece has seen a lot of improvements since then. It works all day, every day to figure out strategies for the next day. Face it, the artificial intelligence is here to stay. For years now we have seen company after company announcing their AI progress and finding ways to integrate it into their services, and the stock market is probably the best possible use for an AI. But, will it be able to help you in your daily tradings? Of course. After all, to make money you need to have an edge over the competition. A software capable of scanning the market and coming up with effective strategies will save valuable time for your investments. And the best part is that you don’t have to program it. During the night HOLLY will scan the market and come up with thousands of strategies. These strategies will be there for you in the morning. This way, you can pick and choose from those strategies to maximize your potential success. Of course, HOLLY doesn’t only operate during the night. It can also provide you with instant, real-time information and updates. The main task of a screener is to provide the trader with the stocks he wants to find. Once the trader sets up the strategy the screener will find companies and stock that meet the trader’s criteria. This screener can even be set up to find certain types of stocks according to the changes in the last minute. With Trade Ideas Screener you can set the search with any a metric you can think of. The number of filters and alerts available to you is in the hundreds. And, of course, you can use one of the standard settings instead while you are still figuring out the inner workings. In the offer of Trade Ideas Pro, you will find multiple trading channels. You can track the channel of your choice and use what you see to make good decisions. A good example would be the HOLLY AI channel which is probably the most important one for individual traders. Another channel that you will probably love is the social media channel. Tracking the social media can give you an edge that you used to only dream of. After all, nowadays, the social media is where you will get the newest information. Not to mention that there are 30 other trading channels you can use too. And these are only the ones that were set up before you even got going. You can customize your channel and perfect your scan with the right use of this tool. To make it in the stock market you must have a strategy. You will have to define entry and exit points and manage your funds. This is something that Trade Ideas Pro already incorporated in their service, the most popular strategies are already configured and ready to be used by you. Creating new strategies is incredibly simple. 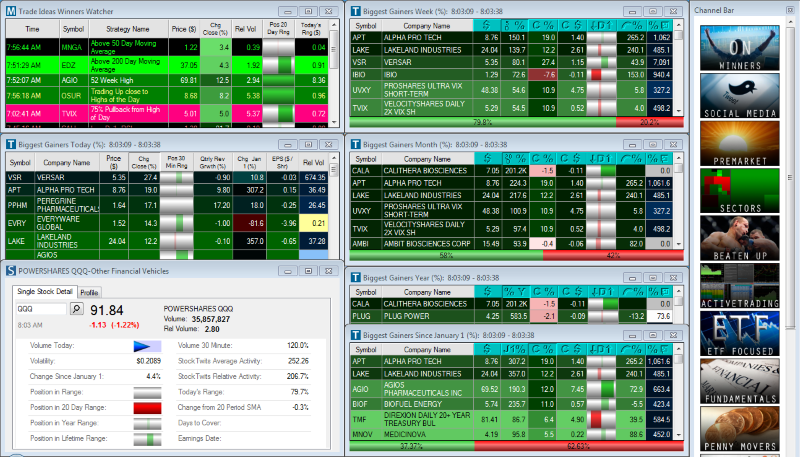 The Trade Ideas scanner has a very simple layout that will help you screen the movements of the market. And, thanks to artificial intelligence, it is continuously improving itself. So, let’s go through some of the components of the scanner. Compare Count Window – you can use it for visual comparison of your strategies. Top List Window – you can arrange the list by any parameter you can think of. Full quote window – provides access to basic information regarding a stock’s price. Efficiently using these options can make a difference between success and failure on the market. You can set your alerts in hundreds of ways. Most popularly to find highs and lows of a day and recognize buy and sell signals. You can then use the filters to filter out the stock you are not interested in for various reasons and only be presented the stock you might consider trading. And lastly, you can use the gappers to find occurrences of a price difference between last ticks of certain assets.